An artist whose work I have been intending to feature for a little while now is the painter, Gwyneth Thompson Briggs. Ms. Briggs, in the words of her own website, is "a contemporary sacred artist in the perennial tradition of Western sacred art. She is dedicated in particular to reviving techniques from the Renaissance and Baroque eras to reveal the glory of God in the midst of today’s ecclesial and civilizational crises." Not a bad mission and vision to say the least. She also has connections to Thomas More College of the Liberal Arts in Merrimack, New Hampshire which will be familiar to many LAJ readers. One of her most recent works, a portrait of St. John Fisher, caught my attention. Fr. 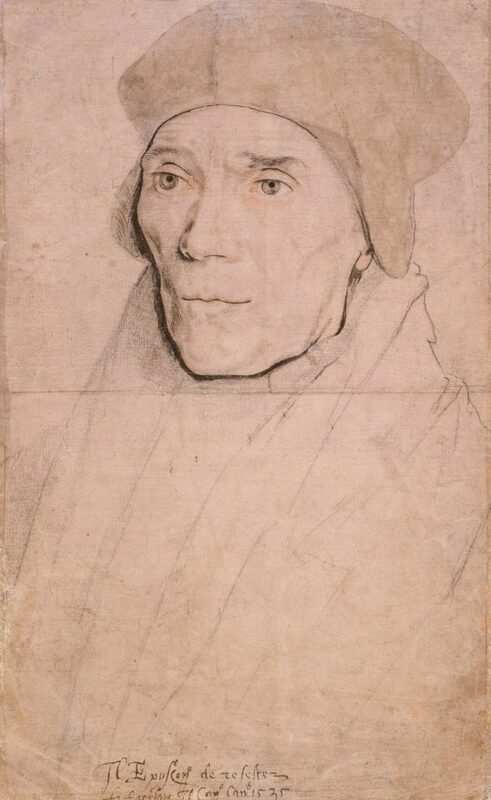 Byrd and the Beckmans were looking for an artist who could create an original image of Fisher in a style reminiscent of Hans Holbein the Younger, who produced a drawing of the bishop during Fisher’s lifetime. 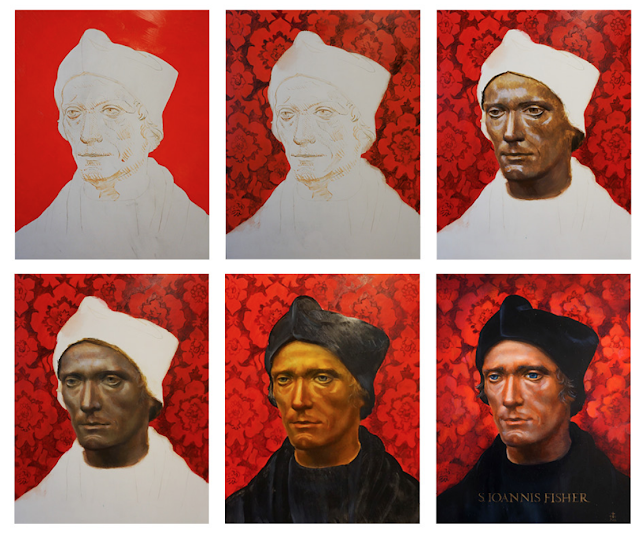 Gwyneth compares combining the Torrigiano bust and the Holbein drawing to stereo vision. She also departed from Holbein in significant ways, especially in the choice of an intense red damask background. A reference to martyrdom and to the cardinalate, to which Fisher was raised shortly before his death, Gwyneth calls the choice of red “daring.” “Portrait artists like Holbein usually prefer cool tones for backgrounds, in order to contrast with warm flesh tones.” In order to bring the figure into greater relative focus, Gwyneth elected to darken the skin tones and created a hierarchy of brushwork by rendering the damask more loosely than Holbein would have. She patterned the damask from an early 16thcentury fabric sample, also in the possession of the Metropolitan Museum, that may have been used for divine worship. Fr. Byrd asked for the saint’s name to be included in the image, so Gwyneth also researched Renaissance alphabets and decided to use lettering adapted by Giovanni Francesco Cresci from the letters on Trajan’s Column and published in Il perfetto scrittore (Rome, 1570). Here is Gwyneth Thompson-Briggs completed work. 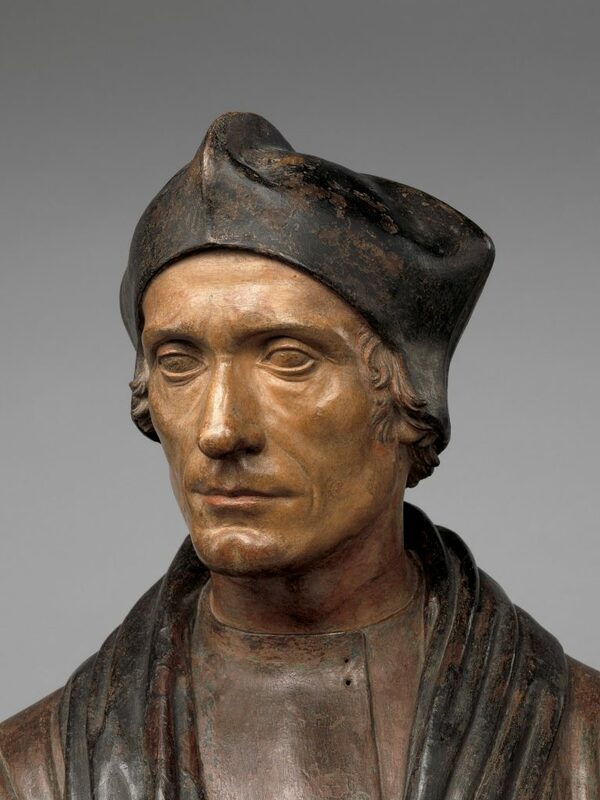 Gwyneth sees her image as closer in spirit to the Torrigiano bust than to the Holbein drawing. 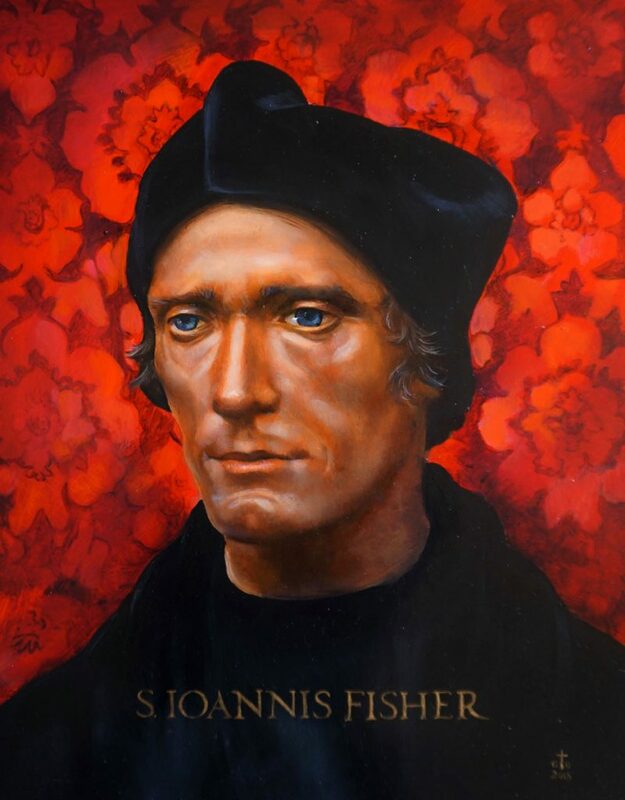 “Although the drawing has a charm and immediacy, I wanted to capture Fisher’s idealism, his heroism, the supernatural reality of him as a man perfected by grace.